line in between give the A1 Sportback a solid stance on the road. The low line between the edges of the wings draws the visual focal point downwards even further. 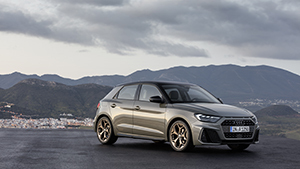 The Infotainment concept in the new A1 Sportback has filtered down from the full-size class. The MMI radio plus comes as standard in the UK – it can be operated via the multifunction buttons on the steering wheel, the smartphone-style touch screen display in the fully digital instrument cluster or via the latest generation of voice control. All versions can be equipped with the optional Navigation Pack or Technology Pack, the former adding hard disc-based MMI Navigation plus with a 10.1-inch MMI touch screen and the higher specification Audi Virtual Cockpit, and the latter both of the above plus the various internet-based services offered by Audi connect and Audi Phone Box wireless charging functionality.